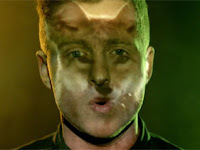 OneRepublic's new "If I Lose Myself" video is a jubilant, vibrant thing, a clip that celebrates the endless possibilities of a Saturday night, the unbridled spirit of youth and the power of a really killer party. And all of that is rather odd, considering the song itself is basically about none of those things. "Even though it sounds like this euphoric, 'let's go crazy tonight' song, it's a bit morbid; it's about going down in an airplane," frontman Ryan Tedder told MTV News. "Waking up on an airplane and finding our you're going down, having that moment of sheer panic, looking out the window, seeing your life pass before you, [but] looking over to your right and seeing the person you love sitting next to you, and realizing 'It could be worse ... the next 90 seconds are going to be pretty thrilling, and this person is with me, so I'm okay.'" And if that seems a bit serious, well, that's precisely the point. Because on their long-in-the-works Native album (due March 26) Tedder and Co. are pushing their pop sensibilities to the breaking point, tackling decidedly darker material, and drawing inspiration from the very forthright title they chose for the project. "We're terrible with coming up with album titles, so starting about three months before we thought the album was going to come out, we were pinging ideas off each other, and we would, like, take turns shooting them down," Tedder explained. "So Brent finally shot out this idea of Native. He saw it on a magazine in an airport somewhere. And from that, we started thinking 'Alright, it's a strong word, what does it mean for us, and how do we tie it into the album?' And so we spent a while doing that ... there's definitely a thread that goes from the title to the artwork, and the songs too." In addition to "If I Lose Myself," the band also singled out tracks like "Light It Up," "Preacher" and "What You Wanted" as being particular favorites from the album, and now, with a release date for Native firmly in place, they can't wait to bring those songs to the masses ... and begin work on the next album, too. "It's been too long. I don't think we'll go three years between albums again. I feel bad for our fans that it took so long," Tedder said. "But you don't realize how many moving parts there are to put something out worldwide, it's such a beast to get moving. Between this album and the next, I'm going to focus on writing for OneRepublic while we're on the road, and hopefully we'll have brand-new material that's evolved before we're even done touring on this album."